Wooden decking can be fantastic for either your front or back garden, providing the upmost quality of an area to relax by yourself or with guests. Weather permitting, wooden decking can be used throughout the year and acts as a raised platform from the grass. You have the ultimate choice of where to have decking installed, with popular choices being outside patio or French doors. This allows you to walk straight out onto the decking and with table and chairs you can enjoy your garden. Wood proves to be the most popular material for decking for a number of reasons and with a range of wood decking designs you can choose something to set your home apart from the crowd. If you want to add something extra to your garden, such as a raised platform that can be enjoyed all year round for a number of purposes, wooden decking is your answer. For up to four FREE wooden decking quotes from local, vetted and reputable installers, simply complete our quick quote form. 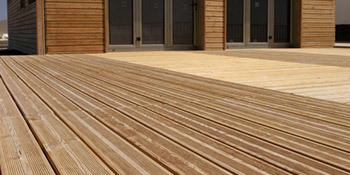 This will ensure you receive the best wooden decking prices and help you save plenty of money on installation. Project: Customer visited the mygardeningprices.co.uk site and submitted an enquiry. Property type: Semi detached, Work description: Patio, fake grass,decking complete garden overhaul. Was very easy to find a specialist for the job, but probably would not recommend for small jobs as most of the companies was expecting it to be a big job with big budget.